In case I forgot to mention it already, I will be away visiting my family for the holidays. It's going to be a wee bit crazy, since there are a lot more relatives coming than I originally thought. Seems that everyone wants to meet my husband, and my niece and nephew who were both born this year. My husband is petrified, having never participated in a big family Christmas celebration. I promised we would go walking, snowshoeing, or skiing whenever he was feeling overwhelmed. Now I just hope they have as much snow as here! I'm really looking forward to seeing everyone, since it's been at least two and a half years since I saw most of them. A lot has changed since then, including meeting my husband. I hope I don't lose my voice, having to tell everything to each person! Both sets of my grandparents will be there, and I hope to spend lots of time with them. They are all getting quite old, and are not in very good health. I'm so glad I have lots of good things to tell them. Anyway, this does mean that my Etsy shop will be closed from the 18th to the 28th of December. You can still buy patterns and books from my Lulu shop, though. I am hoping to have a couple new patterns for early January, and other stuff to update my shop, so don't forget about me! I may blog one or two posts while I'm away, if I have anything really fun and exciting to share. don't look if you're related to me! 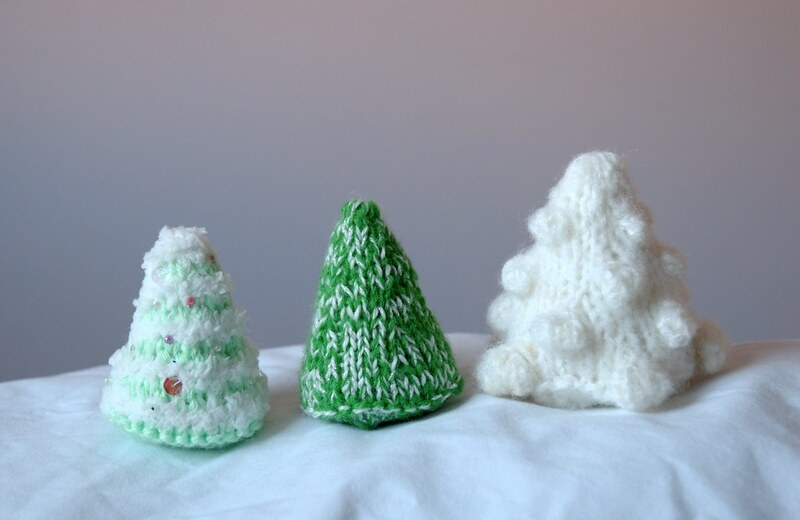 The last couple days I've been working on little knitted Christmas trees. These will be stocking stuffers for my my family. 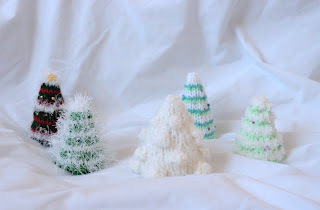 I'm particularly pleased with the white one covered in bobbles. 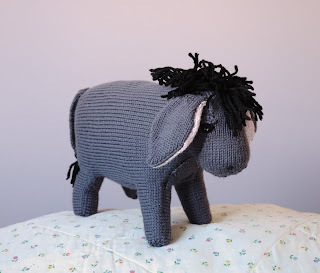 When I offered to make a toy for my niece for Christmas, my brother-in-law asked for an Eeyore, saying he was the most neglected Winnie-the-Pooh character. I happened to have a pattern that was close, and I finally finished his face today. I knit him from Swish Superwash merino, so he's easily washed when my niece decides to get food, dirt, or other nasty stuff on him. I know he doesn't look exactly like Eeyore, but he's still cute! The calf was supposed to be a cow, but I changed the pattern a lot, and he is much to small compared to the other toys to be a cow. I like the idea of knitting more animals for his birthday, and maybe some other farm-type things. I'm also half-way through a pair of mittens, and I have a tuque to knit this weekend. I will try to take photos when they're done, although I haven't much time left before I leave. I am so looking forward to seeing my family again, and maybe dreading it a little too. They are all rather a lot louder than me, and it can be overwhelming. I saw this on Sew, Mama, Sew! 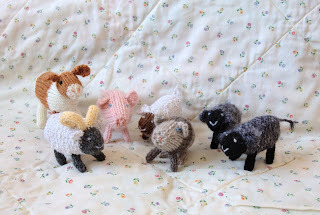 and thought it would be fun to answer a few of the questions, even if my blog is a lot more about knitting than sewing. Hope you enjoy reading my answers! I love giving my family hand-made gifts because I know they will appreciate the time and creativity I put into them, whether it's just a hand-painted card or something I spent hours knitting. I've made several aprons, knitted a bunch of toys, and plan to make a pair of mittens and a hat. Sorry, no photos yet. I don't want to spoil the surprise! This is where I say how adorable and lovable my toys are, and what a great gift idea one of my pattern books would be. My pin cushions would make lovely gifts too, if I ever had time to sew any! My favourite family holiday tradition would have to be the big supper on Christmas day. It's not just the food, which is always great, it's the whole day spent together getting everything ready. When I was a kid, it was always at my grandparents' house. I have wonderful memories of arriving just after lunch to their warm, cozy house. Visiting and playing games with whichever aunts, uncles, and cousins were there that year. My grandpa watching 3 different sports games on the T.V. Delicious food smells coming from the kitchen. Making the gravy as all the food was being put on the table. The steamed pudding my grandma would always make, with two kinds of sauce. Sleepily walking home through the snow. What I've always loved most is finding (or making) the perfect gift for someone, and watching their face as they open the package. It warms my heart to be able to show how much my friends and family mean to me, in even such a small way. What I like least is how some people can be so cynical and try their hardest to not enjoy this time of year because these holidays are so commercialized in so many ways. It's not difficult to just turn away from all the shiny artificiality, and delight in whatever is special to you - family and friends, hoping for better things in the new year, practicing kindness to strangers, or even just enjoying the change in season. Anyone close to your heart that you’ll be missing this year? I won't be missing anyone, because for the first time in years I will be going home for Christmas! My favourite holiday food must be my grandma's steamed pudding. It's full of raisins and spices, and is so rich and yummy. Then you get to put rum and butter sauce on it, or tart lemon sauce. It makes my mouth water to think of it. I have an excellent recipe for chewy ginger cookies. It's in another post, because this one is getting rather long! I've decided to only sell the reindeer pattern until the end of December. It is a rather seasonal pattern, so in the new year I will put up a slightly different version for sale - either a horse or a unicorn. The reindeer pattern will be offered again next autumn, so don't worry that it will disappear forever! I seem to be rushing headlong into the wholesale business! Well, it's not as bad as that sounds. Not wholesale toys this time - I'm still quite firmly against that, except in special circumstances. Wholesale patterns this time. A friend of mine introduced my patterns to a yarn shop owners' list. Now there's all this interest in selling my patterns, and I'm not prepared! I had thought about printing patterns for shops to sell; but when I looked into it, I decided there wasn't enough demand to bother, considering the high cost per pattern. I am now convinced the scheme might work. But it feels like there's such a rush to get everything organized... for Easter! I need to find a printer that will deliver good quality booklets for a reasonable price (which necessarily involves orders of a few hundred). I need to get enough orders to make it worthwhile. Then I need to get them printed and distributed. And this has to be done by the beginning of March, at the latest! I am keeping my sanity by making this a trial. If I don't get enough orders to keep the cost per pattern low enough for me to make a little money, that will be it. People will just have to be content buying my patterns online. Don't get me wrong, I'm thrilled that people love my toys and patterns. But it's just me and my husband running this (and he has a full-time, busy job). There's only so much I feel we can take on, while still making a little money to keep it going. It's a hard balance to keep. I wish you could see the snow here. I want to take photos, but the camera would only get wet. We should have over a foot (or more than 30cm) by the end of the day. They're fat, fluffy flakes too - the prettiest kind. I always enjoy snow days like this, but then, I don't drive :) Good thing I bought myself some new winter boots on the weekend for my trip to the post office. Thanks so much to everyone who bought a copy of our pattern book :) There was a lot more demand than we expected, and we ran out of printed copies this weekend. But if you still want one, you can order it directly from Lulu. 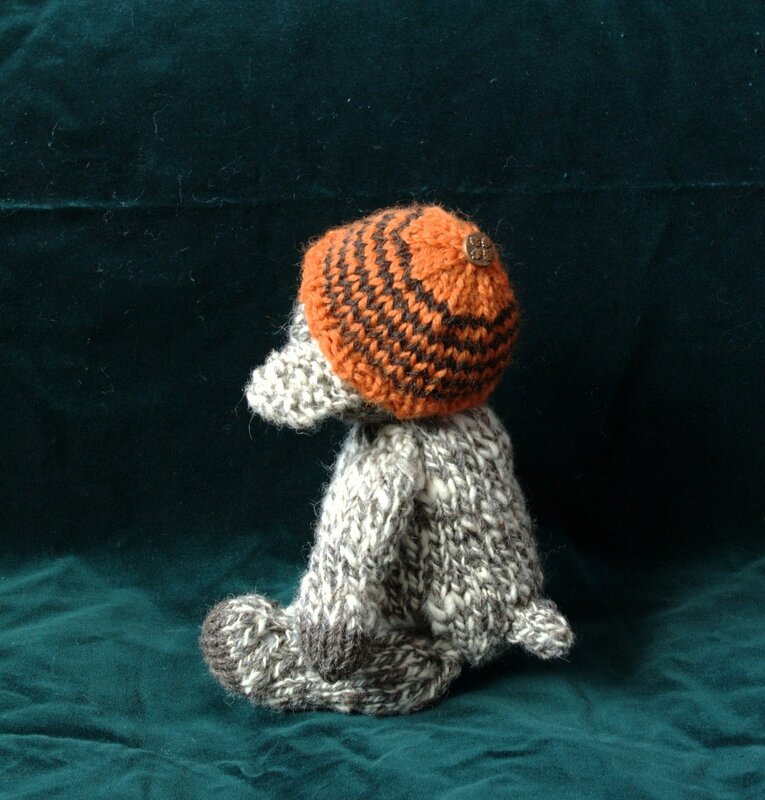 Mr. Mitten is working on a non-holiday version, which will be available in January. It has all the same patterns, only the picture pages have been changed. The kits were a lot of fun to put together, and I will definitely put more in the shop once I have more books. Today will be for working on Christmas presents. I must say, a break from knitting the toys is appreciated. I wouldn't want to get bored of them. I managed some sewing yesterday too, and someone on my gift list is getting an apron made from a vintage tablecloth. Think yellow, brown, and olive 70's goodness :) Sorry, no pics until after Christmas, since I wouldn't want to spoil the surprise any more.